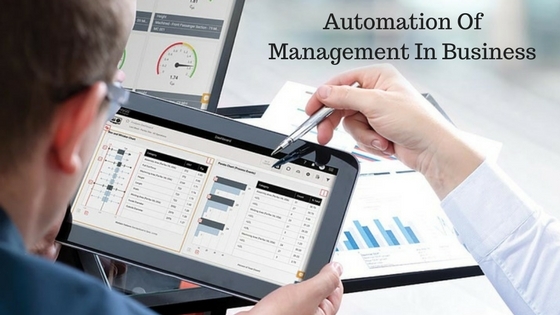 Why Automation Of Management In Business Is Crucial? Today's highly-educated, modern and tech-savvy people have relinquished their love for 9 to 5 jobs. They establish startup companies to capitalize the talent they have, provide job opportunities to desperate candidates, sell their products/services, and earn great revenues. The successful commencement and development of your business depend on how well you manage different business activities and meet the growing expectations of your customers. Many times, it has been observed that business persons fail to manage different business activities. So, they resort to business automation. In these days, the automation of various business processes is becoming increasingly popular with each passing day. Because of business automation, the efficiency of the service increases a lot. It becomes possible because all paperwork is eliminated, all orders are registered in the system and their record is maintained for future communication with clients/customers. It also minimizes delays in the execution of orders. A company needs several employees to perform its daily business activities, such as CEOs, business managers, digital marketing team, marketing experts, laborers, security staff, etc. The company has to bear a huge amount of money to hire those employees and keep them on the job. If the performance of business declines, it becomes very difficult for the company to bear the huge expenses of maintaining those employees. With business automation, entrepreneurs can use dedicated machines and tools to perform numerous business tasks easily and quickly. It helps them to reduce the cost of manual labor and increase the profit margins. When your business grows, naturally, you have a large customer base which increases with each passing day. It is very difficult for any company to handle the requests of millions of customers on a daily basis if they perform their business activities manually. If you don’t serve the needs of customers in a timely fashion, they become displeased with you and stop dealing with your brand. Properly planned and qualitatively conducted automation process allows small and big companies to easily handle the huge flow of customers, attract new and retain old customers, gain competitive advantages, etc. A multinational company has a huge customer base. Every day, it receives numerous requests from customers all across the world. So, the employees of that company always remain under tremendous pressure to complete tasks quickly and address the concerns of more and more customers. So, they lead a stressful life which downgrades their performance at the workplace after some period of time. With business automation services, employees can easily perform numerous tasks within some minutes/hours and serve the needs of a large number of clients every day. This reduces huge work pressure from employees and they lead a stress-free life. A company with a large pool of employees always finds it very difficult to measure the performance of employees at all the times and compensate them accordingly. A business automation software can generate statistics for the performance of each employee or team within a few clicks. This helps business organizations to conduct fair competitions among employees and motivate them to improve their performance. Customer reviews are very important for the success of a business organization. All your efforts of brand awareness will go in vain if customers have a negative perception about your brand. With the help of a customer review management software, you can easily seek customer's feedback about your products/services, brand, etc. So, lets you know that areas where you are working very well and areas which demands further improvement. Just improve those areas and make your business a hit. Companies that provide different types of services/products to customers, always have a large number of orders. It is very difficult for any business development manager to handle the payment for each of them if they work manually. The correctly selected business automation software helps them to track debtors, collect payments from clients in full, and increase the profit margins up to a great extent. They can easily keep a track of expenses and revenues and manage them easily using the automation software. These days, the success of companies depends on various factors, among which the success of business automation matters a lot. Business process automation tools allow companies to perform daily business activities smoothly, address the needs of a large number of customers and increase their profit margins remarkably.